Stuck in a job rut and ready to make your next move, but just not sure where to start? Are you ready to advance in your career, but are afraid that you’ll never get noticed in the sea of applicants all vying for the same opportunity? For many current and prospective candidates, the best way to land their next dream job is to partner with reputable employment recruiters in their region. Why should you considering working with employment recruiters for your next career placement? Working with a qualified recruiting team can instantly give your candidacy a cutting edge over the competition. It’s no secret that, when looking to find a position, it often all boils down to who you know. A professional firm with an established reputation will have an extensive corporate network of hiring managers to help get your resume in front of the right people. Additionally, a skilled recruiting firm will also have insight on how to best prepare you for a particular job; from interviewing to corporate culture and everything in between, an innovative recruiter will offer a wide range of resources to help you get the gig. Of course, once you’ve decided to team with employment recruiters for your next opportunity, it’s important to get them to notice you. 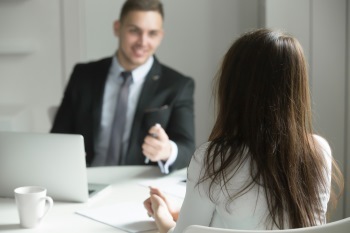 While, initially, you may feel overwhelmed at the thought of connecting with a recruiter, garnering the attention that you deserve can prove easier than you think. The first tip for standing out in the crowd? Apply only for the positions that you are qualified for. Many applicants assume that they should apply for as many opportunities as possible to get noticed. This is simply not the case. Applying for jobs that you have the required skills and experience for can help instantly get your name to the top of any shortlist of applicants. Beyond knowing what you’re a fit for, it also helps to have a list of references ready before you connect with your recruiter. After an initial conversation/screen, a recruiter will often ask for you to send along your list of references. Having them on hand means minimizing time before moving forward in the process and also demonstrates that you are a candidate with a list of professionals ready to recommend you. Also, innovative employment recruiters will help coach you throughout the process so you’re prepared with any of the “intangible” job requirements at any given organization. Listen to them. Being open to and willing to adjust to input is a great way to set yourself apart from others competing for a job. Most importantly, it’s always critical to recognize that successfully engaging with a recruiter is a long-term partnership. Even if you get an offer on the first position you’ve been submitted to, it’s always important to stay connected and build professional relationships with your employment recruiters. It’s a surefire way to stay on their radar and guarantee that they are ready for you the next time you decide to make a career move. Lawler Group’s team of seasoned employment recruiters in Milwaukee partner with candidates in every industry to source their next career move. If you’re tired of getting lost in a seemingly endless sea of applicants, Lawler Group can help. With unparalleled contacts and a superior reputation, Lawler Group can get your resume noticed by hiring managers in your field.